MANILA, Philippines - It's confirmed! Korean boy band Big Bang will hold their "Big Bang Alive Tour" concert in the Philippines this year. A post on Big Bang's official Facebook account and on YG Entertainment's Twitter account proclaimed, "BIG BANG ALIVE WORLD TOUR 2012 in MALAYSIA and PHILIPPINES confirmed!" The announcement of dates and venues of the tour in the two countries will follow. Big Bang, composed of G-Dragon, Taeyang, TOP, Seungri and Daesung, kicked off their Alive Tour in Seoul on March 2 to 4 before sold out crowds at the Olympic Gymnastics Hall. 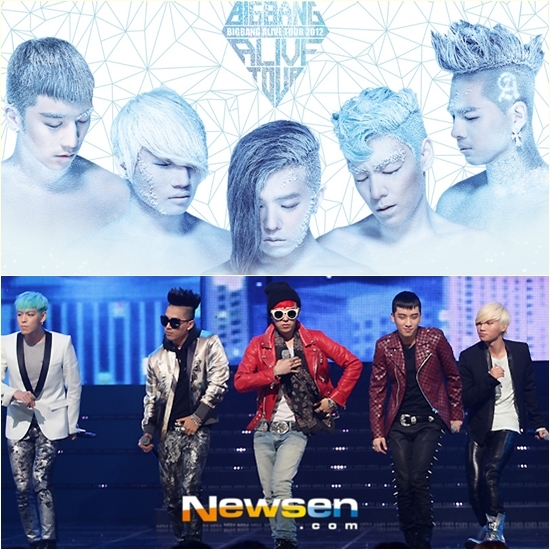 The Big Bang Alive Tour will be performing in 25 cities in 16 countries in Asia, North and South America and Europe. In Japan, Big Bang will be holding their concerts starting on May 17 and 18 in Nagoya, followed by Yokohama on May 25 to 27, Osaka on May 31 to June 3, Saitama on June 16 to 17 and Fukuoka on June 23 and 24. Big Bang Alive Tour is presented by Live Nation Entertainment with Laurieann Gibson as creative director. Gibson spearheaded Lady Gaga’s “The Monster Ball Tour” and was the choreographer and director of the pop star's music videos such as "You and I" and "Poker Face." The announcement of the Philippine leg of the Big Bang concert spread like wildfire on the Internet. Bulletin Entertainment asked Filipino fans of their reaction to the announcement and all of them were excited that, finally, Big Bang will visit the Philippines for a concert. Update: YG Entertainment has announced the complete stops in Asia for the Big Bang Alive World Tour. After Japan, Big Bang will hold concerts in Singapore, Thailand, Indonesia, Taiwan, Philippines, Malaysia and Hong Kong. Go to https://www.facebook.com/BIGBANG/app_375421659159963 for updates about the tour.